New figures have shown that crimes involving firearms rose by 74% between 2012-13 and 2017-18. The number of incidents in that period increased from 253 to 439. 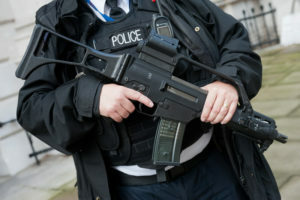 Firearms officers are already stretched, with some regularly working 12-hour shifts, despite the Government’s announcement to set aside funds for 1,500 new armed officers by 2020. However, only 812 have so far been added. West Yorkshire Police Federation Chairman Brian Booth said: “It’s just another example of how frontline policing is struggling with the austerity cuts. “Boom and bust budgeting does not assist armed policing, when it takes three months of training for a Firearms Officer to obtain their Firearms Permit and be ready for deployments. Last year alone, West Yorkshire officers conducted 896 firearms operations.